... a fulltime working mom, juggling with a pair of twin boys and a pair of "look like twin" gals!Blogging as a digital diary to leave a legacy for them. 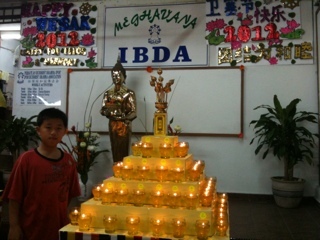 Tonight we attended the Wesak eve prayers , offerings to Buddha & candle walk at IBDA garden. 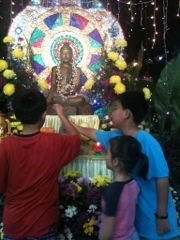 It was a simple yet peaceful celebration with chanting, offerings to Buddha , candle walk, lamp oils offerings for d deceased & bathing the Little Buddha. 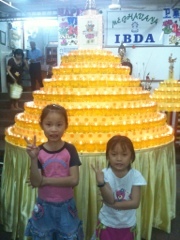 I feel lucky and happy to be able to attend this beautiful occasion with my whole family. ... With home prepared condiments & homemade Mushroom minced meat sauce!! 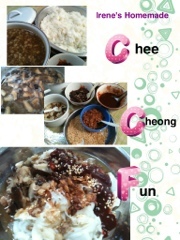 2 Kati Chee Cheong fun ( bgt from local market)@ Rm1.40 per Kati. Dried prawns, mushrooms n minced pork , shallots , corn flour & oyster sauce for the gravy. Dried prawns, cili boh, shallots n Tim Cheong for d sambal sauce. Lots of preparations but easy to self mix and delicious to eat!!! My twins helping out to pack and fill up the box of paper goodies to be burnt as offerings to their maternal & paternal grandfathers for Cheng Beng at the crematorium this year. 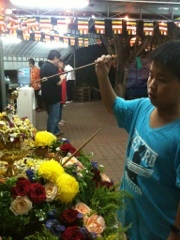 Starting them young with practice of filial piety! Bravo Auntie Anne! U r our true Malaysian Heroine! God bless u with good health n strength to continue being our inspiration!! A sanguine married to a melancholic & blessed with a pair of twin princes & 2 princesses. Blogging this digital diary to leave a legacy for my kids. Vacationphysiomom: a blog about my family's experience of interesting, budget friendly outings and vacations locally & overseas. Contestaddict : a blog to inject all my contest hobby, experiences & winning moments! ArtisticPhysiomom : a blog to capture my Right brain at work & to collect artistic & creative stuff to share. Twinplus : a blog by 3 mommies of twins, who wish to gather all mommies of twins and multiples to share about their parenting journey. How To Score Well on TOEFL? Mothers' Day simple sweet gift! Death - just another word . Is Creativity A Gift or A Barrier? vacationphysiomom is my blog on my family vacations and outings. Physiomom's Playlist.....Back to memory lane..